For those of us who’ve had the pleasure of driving through the Pyrenées, the mountainous region between France and Spain, this sight is all too familiar: hundreds of sheep grazing naturally. The sheepherders of the towns of Saint-Lary-Soulan and Laruns make some of the best cheeses around as they let their animals graze naturally on the mountains. It’s a wonderful sight to behold. 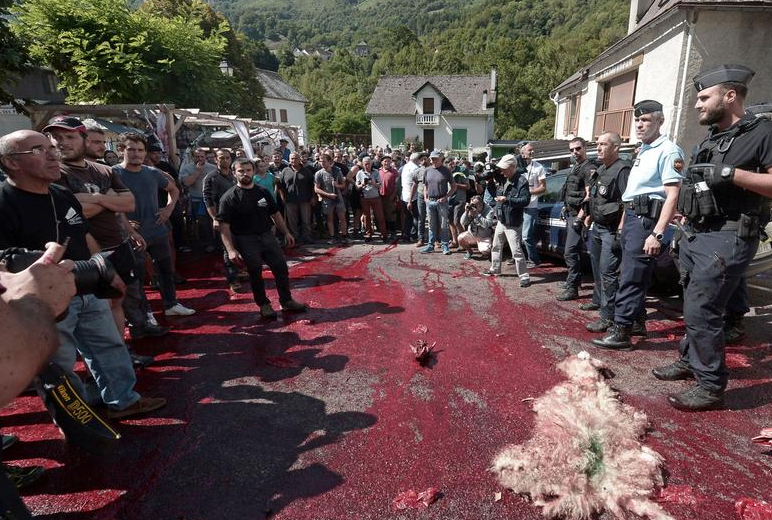 However, as of yesterday, this may become dangerous again as the French government, amid great protest of local Pyrenées farmers, decided to release bears they had imported from Slovenia in the region again, to support the species’ dwindling numbers. Related coverage: <a href="https://thegoldwater.com/news/38657-Canada-Dairy-Farmers-Criticize-Trudeau-For-Caving-To-US-Demands"> Canada - Dairy Farmers Criticize Trudeau For ‘Caving’ To US Demands</a>. The move by the government of President Macron, who recently lost his environment minister who felt he wasn’t doing enough for ‘mother nature,’ was met with fierce all-night protests by farmers who blocked all roads towards their towns and inspected trucks possibly transporting the animals. Official reports state that farmers in the region were compensated for the loss of 798 animals and 25 beehives that were damaged, destroyed or killed by bears in 2017. The farmers say the bear could pose a risk to their livestock and have painted ‘c’est la guerre (it’s war) on the road and on their trucks to protest. French Environment Minister Mr. Francois de Rugy was undeterred, however, saying that the farmers' attitude was "unacceptable," and he condemned people "who feel entitled to set up roadblocks and threaten me with guns." In order to avoid a direct confrontation with the farmers, the government decided to fly in the bear via helicopter and release it from a cage. France ain't the USA with 1000's of sq miles of wildlife populated wilderness that can support a carnivore .